Now I can only sell miniatures as their move to electronic media has disposed for the need for books and cards. Since I don't sell I-phones or Apps, they effectively cut my revenue stream. Another effect of moving their cards online is that the community views and decides the value of a model before it is released. I have to make commitments to my distributors to buy those miniatures long before they are rated by the community. Often, when a model is finally released, the community has decided it has no value, and I end up with several skues I cannot sell. I'm trying to see how this is different for WMH vs every other mini game out there as everyone previews the stats before release. Infinity is probably the closest with the community deciding something is crap before the mini is released (as unless it's a new faction stats can be known for a year before the figure comes out) and it doesn't really affect sales for CB. Difference with Infinity is that it's much more campaign driven than WMH. WMH is solely focused on competitive play, while Infinity is not. Therefore, the competitive players deciding which miniature is crap or gold don't have the same definitive power in the end. I agree with Smellingsalts here, especially on the competitive part. This is what happens when you focus everything on the competitive scene : you have no safety net to recover when the ship is sinking. Why do you think GW manages to stay at the top no matter how competitive players keep saying their games "are garbage" ? Because they know how to make a fun game for everyone, not a tedious one only meant for "The Elite". Truth is, the mantra saying about "games meant for competitive play are the best games" isn't true. The best games are those that you can always play with someone and have fun, not those that take dust on your shelves forever. Often, when a model is finally released, the community has decided it has no value, and I end up with several skues I cannot sell. I think it's a fair point about all the unsellable WMH skus, the game has certainly struggled to achieve internal balance. However WMH, thanks to the ADR and CIB, is also actively having its balance adjusted all the time, giving the potential to give existing models with unpopular rules a place on the tabletop. I think that's pretty admirable, and an endeavor not really possible without digital cards. Actually, no : a competitive player with no one to play against regularly has no purpose. He needs others people to compete against, otherwise how can he be competitive ? Since AoS is made by GW, it's understandable than in some areas, competitive players play it simply because they have lots of people to play against. If in some areas, WMH is pretty dead for finding games, no wonder players go where they actually can do what they like the most. That's the beauty of AoS : by talking to all sorts of players, not just the competitive or the narrative ones, you have always a community staying in hard times. WMH definitely isn't in the same situation here. In my experience, a lot of people who take 40k and AoS super seriously are usually in it because they really enjoy the feeling of beating face and curb stomping people. Games like WMH do not easily allow them to curb stomp opponents due to the fact that there are rarely "flavor of the month" super powerful armies. I suppose my point was that, in a vacuum where people choose to play games based on their design ethos, the players who IMO push AOS past its design parameters would be better served by WMH. Except, as noted, that's not how the market works. Especially the modern minigaming market, which is woefully overwhelmed thanks to KS, the explosion of boardgaming, etc, etc. In WMH, the difference between a good army build and a bad one can literally be the difference between getting to play and watching your opponent kill you before you have a chance to. There are a lot of cool models in WMH that you basically can't use - and I'm coming at this a casual player, not a tournament player that writes off a difference of 1" of movement as "unplayable". What WMH really needs to do is tone the combos way, way down, so that they aren't the dominant driving force in the game. It should be a case of "ooh, I did this nifty thing which gave me an advantage" and not "come back in 15 minutes to find out exactly how badly you just lost". Age of Sigmar is equally combo driven, but I've always felt like the combos were a bonus rather than a requirement just to play. I enjoy how WMH plays. I started in 3rd edition 2 weeks before the nuking of the forums. So sorry about that folks, I can't have nice things. I like the game, and the models. I don't know why other people are so down on them, I really like the Retribution and Circle models. But... The game is really intimidating, and I have only one place to play and it's Friday night. Normally a night I'm doing something else with friends and / or family. So that kind of kills it for me. And I'd also like to see a toning down of the combos. I'd like to see a shift from the multi-d6 system, but that's just me. I'd rather play a quicker game that uses a d12 plus modifier rather than roll 5 d6, discarding the lowest. Now total them up. Now roll 4 d6, discarding the lowest, and total those up, that will impact how you roll the next 7 d6's for ARGH! I just want to roll my 4 attacks at once for the love of an uncaring universe! And damage rolls, too. Srrsly! I like themes. It makes it easy to build a cohesive force. I could live without the free solos... maybe discounted solos? Or make them have a reason to buy them at cost? I'm excited that a change of management may increase the popularity. This dip has let me pick up a good number of models (Pretty much the whole Retribution line) for next to nothing. If I could find more opponents that weren't just Friday night, but local garage gamers, I'd be so pumped! Even the most dedicated WMH horde players in my community have basically stopped, partly due to some heartbreaking losses, but also because without a lynchpin player, people just moved on. Back on to news and rumors. I think the worst fears of the old die hard WMH players will come true and there will be Mk4 that is drastically different. Don't be surprised if we see a focus on ~75 sized armies, but with a unit and turn structure that is more balanced and less mega combo based. The state of WMH and Mk3 is that it's a disaster that's been recovered from to something good, but still has a lot of fundamental issues that won't be resolved until new leadership ignores certain die hards, who aren't buying or playing much anymore, and makes some big changes. On top of the game itself, the WMH setting is interesting and with a unique aesthetic... that hasn't been utilized at all. Where GW used to, and is now pushing hard, the cross media opportunities of Warhammer 40k, their last cross media attempt Warmachine Tactics, was micromanaged to death by PP. Infernals leaked preview after the Kickstarter got to a certain point. 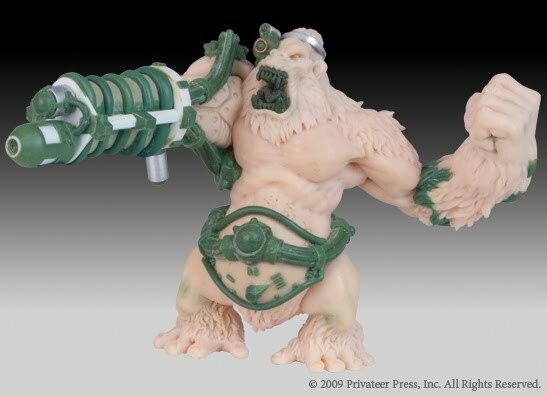 I'm really reluctant to blame Warmachine: Tactics on PP, except for licensing it to those idiots in the first place. It was just a bad game with poor graphics, bad gameplay and an absolutely terrible UI made by people who didn't really know what they were doing. Preview of the Malady Man and his Monkey. I guess they were painting him on stream today or something? I worked at Whitemoon, let's just say that while there were problems, PP's influence on the project was a major part. After all, what's Privateer Press Interactive done these days? If that was solely the issue, and the IP was strong, there'd be other cross media too. That MonPoc art is pretty cool. Nova was from the second series and King Kondo from the fourth, so I'm pleased as punch that MonPoc is continuing to the later series models and factions. Nova, especially, deserves a better model (the original was awful). MonPoc is really a great game that I think deserves more attention. Coming off WMH (and original MonPoc), I admit that I was really worried about how well the reboot would turn out, but I think it is better now than it ever was. For example, WotC does squat for Dungeons and Dragons video games anymore, and that certainly isn't because of a weak IP. And GW still to this day lacks any capacity to identify good ones from bad ones, and has been approving all sorts of terrible things, while sneaking out the Total War deal and the original Dawn of War agreement amidst a sea of garbage. But 'PP micromanages' and there are 'IP weaknesses' aren't really related arguments. And neither justify the state of Tactics as a game. I'm most looking forward to getting the apes. I am happy to see that too. I hope they continue to do more of the later factions, as I think some would look much better in resin. (cue someone ripping on the original plastics... ) The insects and the elementals in particular. It would be fun if they let players vote for particular monsters to be resculpted. I wouldn't mind if they threw in a few new ones too. Not just for any of the existing factions, but maybe something completely new (the rumored 50ft Amazons, and Giant Brain creatures). I'd also love to see them delve into their own IPs to get stuff, like make smaller versions of the gargantuan, and Colossals, or a HUGE alien from their X-files game. The one I want redone the most is Robo-Kondo, from Uber Corp, but I can only imagine he's pretty far down the list. I was thinking about getting into MonPoc, checked the PP website...... they don’t even have all the current released teams on their site. I’d get it from my FLGS or Miniaturemarket anyway, but how are they trying to support it without showing it all? For those who play MonPoc, what is NEEDED to play? I can make my own terrain, but do I need both starters? I like the look of the dinosaur faction so I’ll need all three skus for that (4 with the preview above), but what else? Not only are they doing the later factions for MonPoc, they’re skipping ahead to them before they finish the current ones. 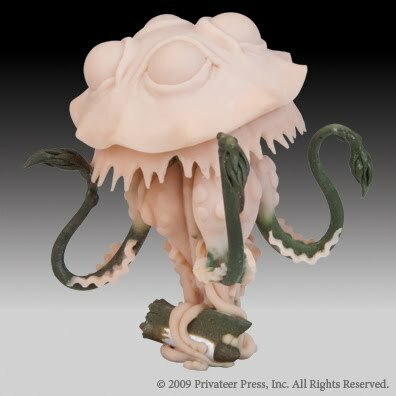 Kraken and the first Mole Man are slated for May iirc. You need at least one starter for the map. Each player needs a set of dice (they're both resource counters and result randomizers) which are currently in the starters but I believe are going to be sold separately soon. An army contains 6-12 buildings as well per side. After that, it depends on game size, a 1 monster game includes 15 units, 2 monster games go up to 20 and 3 monster games (the norm is 2, so this isn't common) go up to 25. Dang! I was doing some snooping, and I never realized that Jason Hendricks had shown the stuff he did for Season/Series 6 of the original Monpoc. Some great looking stuff. I wonder if they would have been combiners like Series/Season 3? Did they ever show the other 3 monsters? Really wish we'd gotten that Cyber-Gorilla! They do already sell the separate bag of dice. Those were the series 2 combiners, yeah. They do show them all, though the two starter sets are shown on the main MonPoc webpage and not in the miniatures list, for some reason. Basically, two starters can play a game against each other. They are a little light on the units (only have 5 per side instead of the recommended 15) and there's only one type of building, but the game is playable and is a representative sample of the game that will quickly tell you whether the game is for you or not. For the Terrasaurs, I recommend the Protector starter, Terra Khan, and the two Terrasaur unit packs. Even if you don't play the big robots, the starter pack gets you (paper) buildings, two maps, dice, and rubble tokens - all required and at a big discount. Plus, you can use the G.U.A.R.D. units with the Terrasaurs (since they are both Protectors), getting you up to the recommended 15 units for a 1 monster game. Also, the repair truck is one of the best units in the game, able to bring buildings back into play. And if you want to get into two monster games, you are just one unit pack away from making that happen. Also, this isn't really a terrain making game. The maps and buildings are kind of characters unto themselves, as you would expect from a game that began as a collectible miniature game - buildings are miniatures you collect too. Which buildings you bring with you and where you place them on the map is a major part of the strategy for the game. They can be used by anybody once the game starts, but faction buildings tend to give a bigger bonus to that specific faction (the Terrasaur one is coming in March). I guess the difference from every other mini game out there is that there are no longer a lot of mini games out there, that sell anyway. Since the beginning of the year I have blown out Malifaux, The Other Side was dead on arrival. WMH is circling the drain. Rune Wars just got discontinued. I am holding on to infinity a little longer but many of my distributors are discontinuing it. Honestly, only GW and the Wizkids and Reaper plastic miniatures are doing well. As a store owner I have to put my money towards what turns over easily and reliably. Also, WMH suffers from skue bloat. Way too many models being released, only a few of which will really be used. Their warband organization is too simplistic and results in just the good units being taken. Which is a real shame. I've got no issue with GW stuff; I play and quite enjoy all of it, but its meatiness is really only in consumption. I get bored with them as a weekly thing or even several games in a tournament setting. I'd rather play a variety of games in general, but if I was held to a single game system for years at a time, Malifaux, Warmachine or Infinity would keep my interest as far as actually playing games. One of my frustrations of the last year is noticing that there's been more of au move towards collecting all the new GW shineis, but not much in the way of actually playing games. Each week there's tons of excitement about the new stuff, but in terms of games played the aforementioned trio seems to get way more table time. There's no doubt that from a purchasing standpoint the excitement is all GW though. 1) My experience with MonPoc 1.0 was that you really wanted buildings (see above), and lots of them, but that they were especially coveted, so either prohibitively expensive on the secondary market or just not available. I say this as a person who tried to play the game - which has SO much appeal to me - but felt like I couldn't largely due to minis not really being available. And yes, I hate blind boxes and the resale market they create. Is this the case with MP2? Both the reliance on buildings and their unavailability? Thanks for the help, I've been pretty out of the loop on the return of this game. Having no local representation doesn't help (though I know our ex-PG loves the feth out of it). 1) They're just as vital, but availability isn't an issue since there's no blind purchase system. For the most part, the building rules don't really reward much in the way of duplication, so you're probably fine just getting one of everything over deciding how many you want. 2) They make fantastic proxies. The fit absolutely fine in the game, they're just not nearly as impressive model wise, particularly the buildings. One thing I noticed with units in the new Monpoc, is that there's no longer a limit to how many of any unit you can take (or at least I didn't see anything about it in the rules pdf). In Monpoc 1.0, you could only have 3 of any unit, and if they had an elite version, you could take 6 (3 of each), but that doesn't seem to be the case anymore. So why would you not take all elite units?